This past weekend, I was sitting on our back porch dehusking corn (is that even a thing?) and jumping up every once and a while to pull a few leaves off of Hubby's basil plant for a tomato dish he was making. I suddenly became acutely aware of a bird chirping quite a bit more loudly than all of the others. I scanned the trees above me, and I spotted it: a robin sitting on a branch almost right above me. I could hear the other birds, but this was the only one I could see, and it was definitely the loudest. For some reason, it made me think of Joey. Joey was always the center of attention. If he wasn't, he did his damnedest to make sure he was. That both delighted me and maddened me. For some reason, I couldn't stop staring at this bird and listening to it's chatter. I was mesmerized, and lonely for my sweet little boy. Some people think that when they see butterflies or lady bugs or some other animal, it's a sign that their loved one is near. I'm not sure I believe that; although whenever I see a striped cat, I definitely watch it for a while. I'd give anything to see my darling son again. Not sick Joey, but Joey before his diagnosis: happy, laughing, full of ideas and energy, lean, strong, and healthy. And for a person like me who has so many vivid dreams every night, I've only dreamed about Joey 2 or 3 times since his death. I long to see him if even for a brief moment in my dreams. A good friend sent me a message yesterday. Her son's best friend died in an accident Saturday night - just shy of 13 years old. She is beside herself, not knowing how to help her friend or what to say to her son. And my heart is heavy because yet another family has to figure out how to move ahead while carrying the heavy burden of grief with them. The thing is, we all grieve. We are all grieving something. I didn't realize this until I actually was grieving, and started to notice other people's pain because of my own pain: death, divorce, diagnosis. These and other life changing events can send us into a tail spin. I want to give a voice to that grief. I want to be an outlet for people's stories of grief and pain. And I want those stories to provide inspiration and hope to others who are grieving. I am starting a new series called Grief Stories~Inspiration, Hope, and Healing. It will be a series of posts contributed by other bloggers who will tell their stories of hope and healing through grief. I am excited to share these with you, as everyone has his or her own story which can inspire and heal others as well. I'll be bringing you the first story next Thursday, August 1st. It is from Meredith, The Mom of the Year. She has contributed to kissing the frog in the past, and I'm excited to have her back. 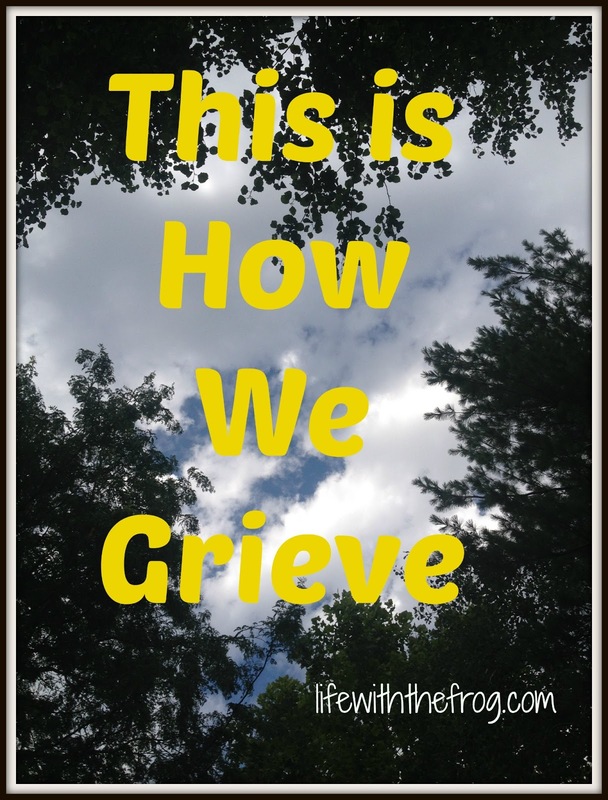 If you are a blogger who has a story of loss and the hope and healing that came after and you'd like to be considered for a guest contribution, please e-mail me your post at kathy@lifewiththefrog.com. 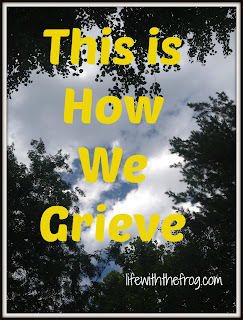 Grief can do it's best to drag us down if we let it. But, it can also provide hope and healing if we can see it. Let's let people see that this is how we grieve.